Space Safety » Archive » Space Hazards » Asteroids and Comets » A Change of Heart in NEO Size of Interest? 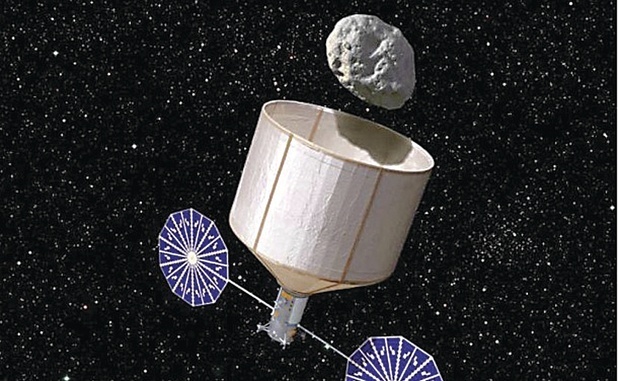 Keck’s asteroid capture concept, now part of NASA’s budget proposal (Credits: Rick Sternbach/Keck Institute for Space Studies). I’ve been following the various twists and turns in NASA and private interest in NEOs for a few years, ever since the Flexible Path concept was suggested by the Augustine Committee. While I’ve always been of the opinion that the Moon makes the most sense of all the potential off-Earth bodies to settle and develop, I at least could see the appeal of the original Flexible Path concept. Basically you stagger the development of systems in a way to keep the peak “cashflow” needs for NASA as low as possible, and try and do some useful missions as soon as enough mission elements come online to support those missions. At least at the time, that seemed to imply that going to NEOs before the Moon looked feasible. But somewhere along the process, that idea seemed to go off the rails. Instead of NEOs being a quick “target of opportunity” that could be visited cheaply along the way to the Moon and eventually Phobos, Deimos, and Mars, you started seeing concept architectures coming out of NASA for these massive NEO mission stacks complete with four or five new pieces of expensive in-space hardware that needed to be developed (a Hab module, an MMSEV, a CPS, a big solar electric tug or two, etc, etc) just to visit a NEO. At first I was somewhat baffled at why NASA thought you needed a significant portion of a Mars mission stack to visit a NEO. After all, Josh Hopkins of Lockheed Martin had suggested a much more modest approach (Plymouth Rock) using just two “kissing Orions” that seemed to close just fine. After doing a little digging, and talking with Josh and others involved in looking at NEO missions from outside of NASA, the best answer I could get was that NASA had set some rather arbitrary minimum requirements that were driving their mission analyses. One of the most important of these was the minimum size of interest for NEOs. Simply put, they didn’t want to go to too small of a NEO, for fear it either wouldn’t be scientifically interesting (yeah right), or because they were somehow afraid that people wouldn’t be impressed to see an Orion visit a rock not much bigger than itself (more likely reason IMO). I can’t remember what the minimum size they set was, but I think it was somewhere in the 60-100m diameter range. The problem is that for NEOs, that narrows things down a lot, which makes mission opportunities much less frequent, and also eliminates many of the easiest to visit NEOs. Hence the big mission stacks. Not only that, but the larger the NEO targets you look at, the fewer “undiscovered” NEOs there are out there to potentially increase your number of potential targets–we know where most of the biggest stuff is, it’s the sub 100m ones that we only know a small fraction of. Anyhow, we’re three longwinded paragraphs into this blog post, and some of you are probably wondering “what’s Jon’s point?” The point of this blog post is merely to point out the amusing fact that while before NASA wouldn’t even consider sending a mission to a 20m diameter NEO, the new plan would have them visiting a 5-7m diameter rock instead. While I’m not at all opposed to the new “fetch an asteroid” mission (other than the fact that once you’ve brought it back to L2, justifying using Orion/SLS to visit it seems wasteful), I just find it amusing that all of the sudden 7m is exciting, edgy, and NASA-hard, while before it was well below the threshold of interest. Not even yawn-worthy, really. I guess I’m just curious what NASA could’ve done if they hadn’t originally restricted smaller NEOs from consideration when doing NEO visit architectures. I’m glad they’re finally reconsidering that arbitrary assumption though. – By Jonathan Goff. Jonathan Goff writes the popular space blog Selenian Boondocks at those rare times he can tear himself away from his day job as CEO of Altius Space Machines. Opinions expressed are those of the author and do not necessarily reflect those of Space Safety Magazine or its sponsors. This article was republished from Moonandback with permission of the author and editor.